Patrick finds out from his credit card company that there have been mysterious charges to his card, but Robin lets him know that she ordered a hot tub because of the double air miles. Lisa shows up and takes herself off of one of Patrick’s cases, claiming that she’s avoiding working with him. After she’s gone, Robin and Patrick talk about how romantic a hot tub would be, until Patrick gets another text that the company is freezing his account. He begins to wonder what’s going on. Michael’s still trying to help Abby clear her name, but Jason explains about the custody battle and wants Michael to keep his nose clean to help Carly win custody. Michael doesn’t understand why Carly would leave Josslyn, but Jason explains the Brenda thing. Michael feels he can help his family and Abby. Jason warns him again to stay clean and play it smart. Olivia stops by Dante’s and the two discuss Brenda and Alec. Dante explains that Lucian’s family were friends of Suzanne’s, and that’s why she was able to use him as a decoy. Dante thanks Olivia for being such a good mother to him. When Olivia gets home, she finds Steven waiting for her, playing guitar. He sings her a song. The two talk about their past and then kiss. Johnny’s mad at his father for attracting so much attention and trying to run things. Anthony tells him to stop disrespecting him and that he needs to be more aggressive with Michael. Lucky shows up to make sure Anthony is complying with the terms of his release. Anthony plays crazy and brings up drunken Luke hitting Jake. Lucky warns him to shut it, but Anthony keeps pushing until Lucky punches him in the mouth. Johnny tells Lucky to leave and proceeds to get angry with Anthony for provoking Lucky. However, Anthony points out that they now have leverage over the police, because he knows what buttons to push. Carly shows up at Kelly’s to find Luke pouring whisky in his coffee. He’s happy to hear about Joss’ release from the hospital, but when Carly explains the custody issue, Luke wonders if she’s asking for his help. 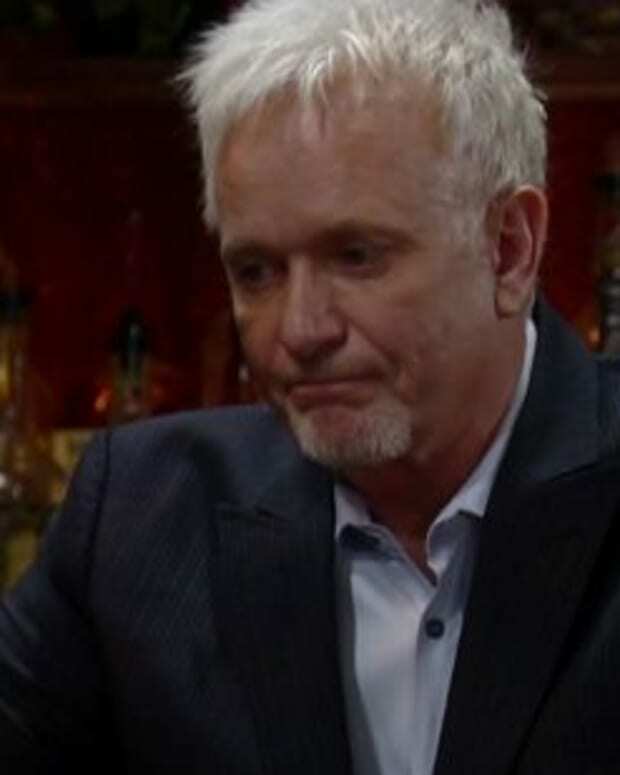 Carly reminds him of his addiction to booze, but he fires back by saying she’s addicted to gangsters and asks again if she needs him to intervene. Carly says they make a good team, but nothing can happen until he goes to rehab. Luke runs into Lucky on the docks and Lucky tells him what happened with Anthony. Lucky brings up alcohol again and feels it will end up killing his father, because there is only so much the body can take. Luke blames everything on Lucky dealing with unspeakable loss. Lucky says that while part of him respects Luke for sticking to his guns, he needs to save himself. Ethan finds Kristina at Kelly’s and explains that he’s hiding from Luke. He’s still upset that he took part the intervention for Lucky, but feels he shouldn’t pass judgment on Luke. Kristina wonders if the solution is to avoid Luke until he goes to rehab. She offers Ethan one of her herbal pills, but he tells her they’re hydrocodone and wonders where she got them. She explains that Lisa gave them to her and Ethan presses her about her strange behavior. She admits that Lisa has been in the Drake’s house on occasion. Ethan takes the pills and tells her to call him if she needs help. When Lucky comes into Kelly’s, Kristina is leaving a message for Lisa to meet her. Lucky finds one of the pills on the floor, and questions Kris about it, but she claims some kids must have dropped it. He tells her it’s hydrocodone and she doesn’t want to mess with it. He looks longingly at the pill, but then drops it in the garbage. Lucky&apos;s behavior prompts Kristina to ask if he’s okay. Abby tells Michael that Diane is going to use the battered woman syndrome defense in order to work the system, but Michael still doesn’t like it. He explains that Jason wants him to help Carly with the custody issue, but he’s more concerned about Abby. Michael feels he can work Anthony to get a lead on the hit woman and Abby agrees to it. The couple shares a kiss. Ethan shows up at Johnny’s and explains about Lisa, Kristina and the drugs. He also clues Johnny in to Lisa&apos;s access to the Drake house. Ethan warns him that if Johnny’s not going to take care of Lisa, he will. Lisa and Kristina meet. Kris wonders why Lisa lied to her and told her the supplements were herbal. Jason meets with Carly on the docks and the two discuss the custody situation, while Luke stands nearby and listens. Carly’s sad that her perfect family is a thing of the past. She tells Jason that on paper, Jax looks better, but she needs to make him look worse. Jason warns her to keep her cool and he’ll help her. Luke comes out of hiding, ribbing Jason about kids and how he must love them, except his own, whom he dumped on Lucky to raise.